The hard, outer layer of the tooth is called enamel. 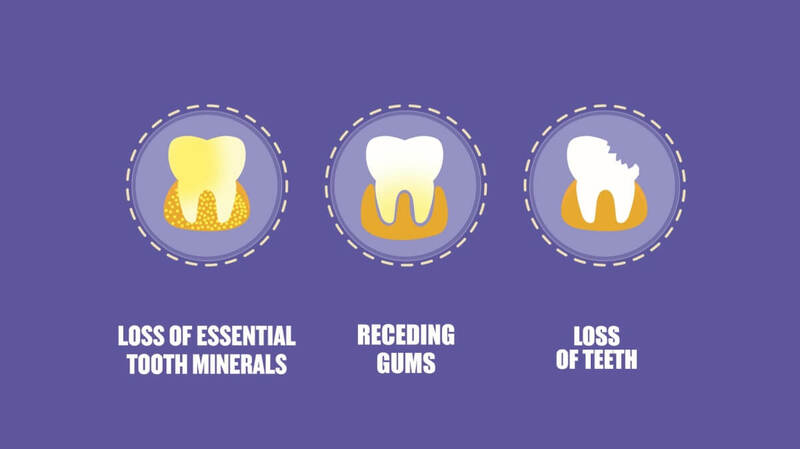 When the enamel of the tooth is destroyed, it can cause the tooth to break down, and this is tooth decay. Tooth decay can happen at any age. Plaque is a sticky film of bacteria, which is constantly forming on the teeth, no matter what you eat and drink. If plaque is allowed to stay on the teeth, the bacteria in it produces acids that attack tooth enamel. Since plaque is sticky, it keeps these acids in contact with the teeth, and cause cavities and break down of the teeth. Bacteria that have grown in teeth fillings or corners that are not regularly properly cleaned can also affect the gums, and the decay can spread quickly, causing the tooth to decay. Not brushing your teeth regularly, not flossing regularly, not brushing your tongue, and not using a mouthwash: all of these mean that you are not maintaining proper dental hygiene, and are at great risk for tooth decay. Like the rest of your body, your teeth also age naturally and break down over time. Also, if you have not maintained proper dental hygiene when younger, your teeth will break down more easily as you get older. Enamel break-down causes deep crevices in and between teeth. These crevices are convenient spots for bacteria to hide and grow. As food particles also get stuck inside, the bacteria grow rapidly. These crevices need to be sealed by a dental professional. Saliva provides many benefits to the mouth, one of which is inhibiting the growth of plaque. A reduction in the production of saliva, for any reason, leaves the mouth dry and susceptible to bacteria growth. A common symptom of stress, tooth grinding is an almost unconscious act. Most people grind their teeth when asleep, but it can even happen when awake, during periods of stress. Continuous grinding strips away the outer layer of tooth enamel, which causes the tooth to break down. Tooth decay is also a genetic issue, which you can inherit from your family. If you do have a family history of dental issues, you need to be extra careful and vigilant with your teeth to keep them healthy for longer. Foods that are high in sugar, carbs, and acids cause tooth decay. Consuming large quantities of such foods, and not cleaning up after, will weaken the teeth quickly. Sugar is a favourite of the bacteria in your mouth and helps them produce the acid that breaks down tooth enamel. Similarly, acidic foods like soda, fruit juice, and even fish and bread, can cause tooth decay directly, without needing bacteria to do it. When your teeth start losing calcium, you will notice discolouration in the form of yellowish or white spots. You cannot easily see the deterioration of the enamel as it happens beneath the tooth surface, but once this happens, you will need treatment. Dentin is the core of your tooth. If you do not stop the enamel breakdown in time, it will start affecting the dentin, and you will experience pain. As the bacteria grows deeper and deeper into the tooth, it eventually reaches the nerves, which becomes infected. This causes pus to form, and the blood vessels and nerves in the pulp to die. This is the final stage of the infection when the root tip of the tooth and the bones surrounding it are infected. You will experience severe pain and maybe even swell in the mouth and face. Intensive treatment or tooth extraction is the only solution then. Caries starts off with very minimal signs, and you have to keep a watch for it. You will notice an only slight discolouration in the teeth, and some yellow or white spots, which are easily missed. Regular dental check-ups will help you catch caries at the initial stages, as the dental professional will check every tooth from all angles. Any kind of pain or sensitivity in the teeth should also not be ignored, as this can indicate caries. Enamel – As bacteria produce lactic acid, it erodes the enamel of the teeth. This demineralisation of crystals in the enamel becomes deeper and deeper until it reaches the core. Secondary – This happens when the edges of restorations and fracture places in the mouth have not been done properly. A correction of the original restoration will help remove caries. Acute – When the growth of caries in the teeth is rapid and extensive, it is categorised as acute. Lesions of acute caries are light brown or grey, and it can infect multiple teeth at the same time. Arrested - Caries that does not grow further is called arrested caries. This can happen when you catch the start of caries and take the required hygiene measures to stop the spread of the decay. Early childhood – Babies and young children tend to sleep while, or soon after, drinking milk. The residual milk left in the mouth can feed bacteria, and cause decay. Once the first teeth appear, avoid putting the baby to sleep with milk in the mouth. Brush properly, twice a day, for at least 2-3 minutes, with a fluoride toothpaste. Floss daily and clean properly in crevices. Clean the tongue with a tongue cleaner. Use a mouthwash to wash away bacteria from every crevice and hard-to-reach places. Maintain a nutritious and balanced diet, and limit sugary and starchy foods. Treatment for dental caries depends on the stage at which it has been caught. Initial caries can be removed by simple cleaning, and upping the oral care regime. As the decay progresses, you will need professional treatment, ranging from fillings to root canals. Some conditions may even require minor surgery. Avoid getting to that stage though, by maintaining good oral hygiene and keeping the teeth clean and healthy.